CDE has launched the Combo™ in a move set to revolutionise the wet processing industry. 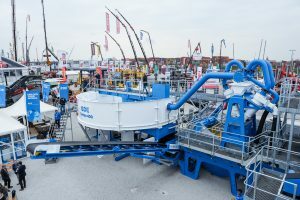 The patented Combo™ – the world’s first all-in-one wet processing plant – was unveiled at bauma in Munich, the leading trade fair for the construction machinery and materials industries. CDE which has a long history of ground-breaking innovation and holds more patents than anyone else in the sector brought the pioneering M2500 to the market almost a decade ago. The Combo™ encompasses five processes – feeding, sizing, sand washing, stockpiling and complete integrated water management which is a first for the industry and an important innovation to address a challenge faced by all customers of wet processing systems. 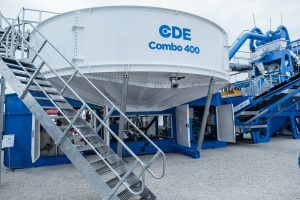 In brief, the Combo™ creates enhanced reliability and efficiency offering rapid onsite set-up, reduced start-up costs, the ability to process a wide range of feed materials (both natural sand and crushed rock), lower power consumption, a smaller footprint and unrivalled accessibility for maintenance. Pre-tested and pre-wired before dispatch, the Combo™ arrives on-site in a single unit ready to plug and play either as a standalone plant or as part of a larger turnkey solution. The plant is built for rapid assembly and set up and can start processing material within days of arrival onsite. Also, as it sits on its own chassis, the Combo™ requires minimal civils and pipework so operators can now easily relocate their plant across sites or to remote locations. 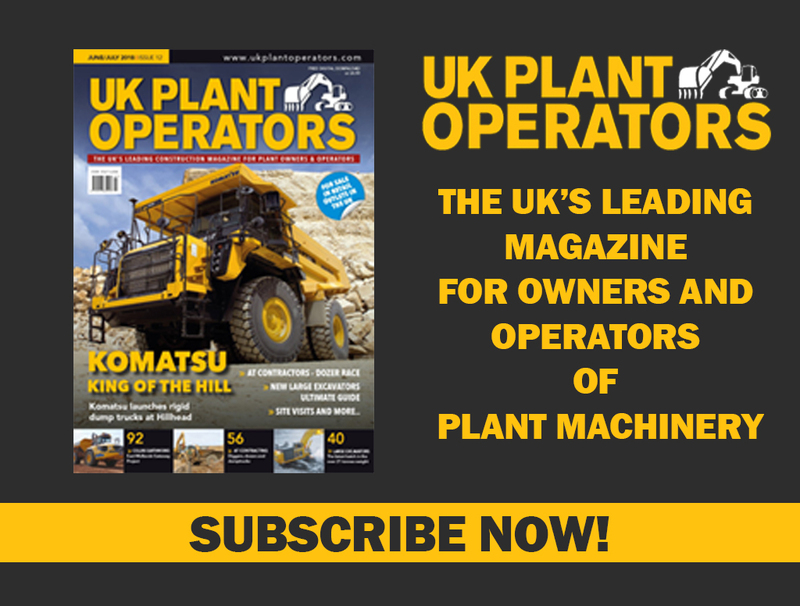 Its smaller footprint also makes it ideal for tight quarries in urban settings. With all essential processes being housed onto one chassis, the Combo™ system operates as one interconnected and pre-assembled unit which incorporates an integrated control panel with one single point of operation. Significantly, the Combo™ wet processing system can produce up to two in-spec products from natural sand or crushed rock turning what is often considered a waste by-product into a product that adds value to the business. The Combo™ all-in-one wet processing and water recycling system. In addition, the new technology allows customers almost total independence of water supply with up to 90% of process water recycled for immediate re-use in the system – ideal for jurisdictions with limited resources or those with existing environmental or impending environmental legislation. A customer-focused solution, the Combo™ has been designed for single-operator use and unrivalled ease-of-access for routine maintenance with its patented swivel access to the pump leading to maximum production and prolonged life. Lower power consumption compared to existing technology available on the market means customers can process a higher volume of materials with reduced operating costs generating exceptional return on investment. Kevin Vallelly, Director of Engineering at CDE, said: “At CDE we are unlocking a New World of Resource and driving alternatives for sand production. Global demand for construction sand is more than 15 billion tonnes per year. Sand accounts for 35% of concrete which is used in the building construction industry. Large parts of the world face increasing demand for infrastructure and civil projects in the face of diminishing natural resources.